Asolo Italy...Imagine climbing up a long winding road immersed in a breathtaking scenery blessed with a mediterranean flora of olive groves and hundreds of cypresses all around. You can see these tall and slender trees from far away, rising high against the sky over the rolling Asolo hills. Asolo (accent on the a) is part of the inner circle of the medieval towns and villages of Italy which have been certified by the prestigious Touring Club Italiano with the so called Bandiera Arancione seal (orange flag). 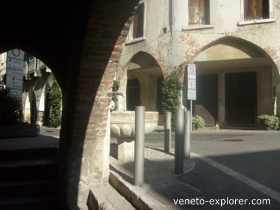 It means that it is one of the most beautiful and well preserved hamlets both of Veneto and Italy. It is a heavenly village perched above gentle hills, and called the town with a hundred horizons, due to its hilltop position allowing a 360°view over the surrounding hills, mountains and plain. Asolo has a long hospitality tradition, and it was beloved by italian and foreigner artists, poets, writers, Heads of State. Just to name a few, the American writer Ernest Hemingway, and the British poet Robert Browning(1812-1889), who dedicated to Asolo a poetry titled with the fancy word Asolando, has lived here. Then, the British passionate writer and traveler Freya Stark (1893-1993), who elected Asolo as her source of inspiration. She is now buried in the local cemetery. Even the famous Italian actress Eleonora Duse (1858-1924) bought a house in Asolo, where she would often go for a respite. Not to speak about the Venetian-born queen of Cyprus Caterina Cornaro(1454-1510), who chose to spend her years in exile in a somptuous Renaissance palace of Asolo, surrounded by a court of artists and intellectuals. Thanks to both its position and mild climate, Asolo has been inhabited since antiquity. Among the major heritages left from the roman times, there is La Bot , just in the main square, still working nowadays and considered one of the most interesting roman aqueducts dug into rock. The first trait can be visited, but only on Sunday. The town has preserved all its harmony and medieval ambience, and you will be feasting your eyes both with the natural scenery, and with its own architectural style, mostly the venetian-gothic of its windows, with its endless porticos. If you want a break, you have plenty of options. 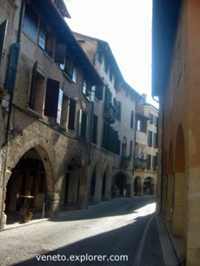 Asolo is full of osterie - typical old style taverns - and outdoor cafés. Sit down, sip a glass of Prosecco wine, made in the nearby Valdobbiadene area and taste some cicchetti, typical appetizers finger food. Calmly stroll around in this corner of heaven. Start from the main square, look at the elegant 1400’s Palazzo della Ragione, with remains of ancient frescoes on the external walls of its loggia. You might also want to visit the Town Museum housed in the Palazzo, featuring noteworthy paintings of renaissance artists, and some archaelogical remains found in in the area. The cathedral in front of the Palazzo della Ragione is very old, having incorporated a previous building dating back to the Roman era. The facade is impressing, but unfortunately -in my opinion - the interior has lost part of its ancient allure, as it has been remodeled in 1747. Inside you'll see paintings of the 1500s', made by Lorenzo Lotto and Jacopo da Ponte, plus some other 1400s’ ones. Walk forward to Robert Browning street, and dip into a blaze of ancient houses with arcades. 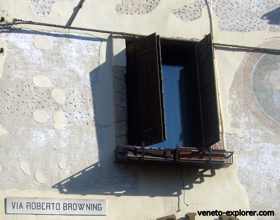 Have a look at the Robert Browning house before getting to the fork, where lies the Fontanella Zen (Zen Small Fountain) dating back to 1572. Just in front of it you will see the Freya Stark house. 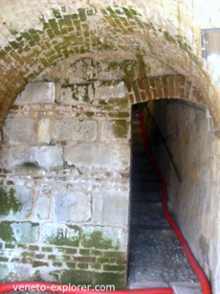 You might also want to walk forward to the house of the late venetian composer Malipiero. Go back to the square and head for the opposite direction, to via Canova, toward Borgo Santa Caterina, for a 15 minutes walk. You'll keep enjoying the view of rows of typical ancient houses with arcades. You will pass the Eleonora Duse (1858-1924) house. She was a very famous italian actress of the past, partner of the writer, poet and fascist military Gabriele d’Annunzio (1863-1938). After the beautiful Hotel Villa Cipriani, with its park from where you can enjoy a stunning view over the Colli Asolani, go on as far as the ancient Convent of Nuns and the Church of Sant'Anna. In the nearby cemetery were buried Freya Stark and Eleonora Duse. 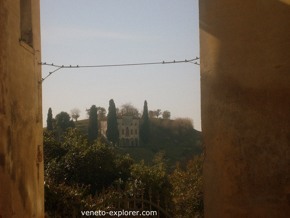 On your way have a look at the impressive and iconic Villa Contarini Degli Armeni which stands up on the top of the opposite hill. Go back to the Piazza Maggiore and walk up to the old Castle, the Palace of Caterina Cornaro, with its characteric tower. Finally, if you like walking, hike up the steep trail to the ancient Rocca for a 15 minutes walk, immersed in lush olive groves and silence. 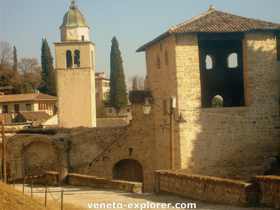 Asolo is a small town and it is not packed with hotels. I have selected the best of them, all superbly rated in independent guest reviews on the Internet. It's about 3 ancient noble country-villas located in the historic centre or nearby, blending the charme of the old times with the comforts of modernity. Read here about the 3 best Asolo hotels. While strolling around in Asolo you will notice mostly high quality stores, with fine local wine and food, and high quality artcraft... nothing to do with the poor quality stuff often sold in many mass-tourism-destinations. Yes, it’s another pleasant aspect of Asolo: there is no low quality just-for- tourists-stores all around, selling all kind of junk. At least I haven’t seen them. As you are in a wine area, you might want to go for a bottle of Prosecco wine, or for the Montello and Colli Asolani doc wines. They also make an excellent olive oil as well. The surrounding area is tremendously rich in renaissance villas, whose wide properties are often planted with olive groves. Just in 2010 an olive oil brand made in the Asolo hills has been rated the best of Veneto. Asolo is also a towns of antiquarians: if you like antics, drop in at some of the antique stores, or make a deal at the traditional antiques street market, taking place in the main square once a month, on every second Sunday. There is a tradition of antique lace as well. You can easily find the store where they both make and sell lace.